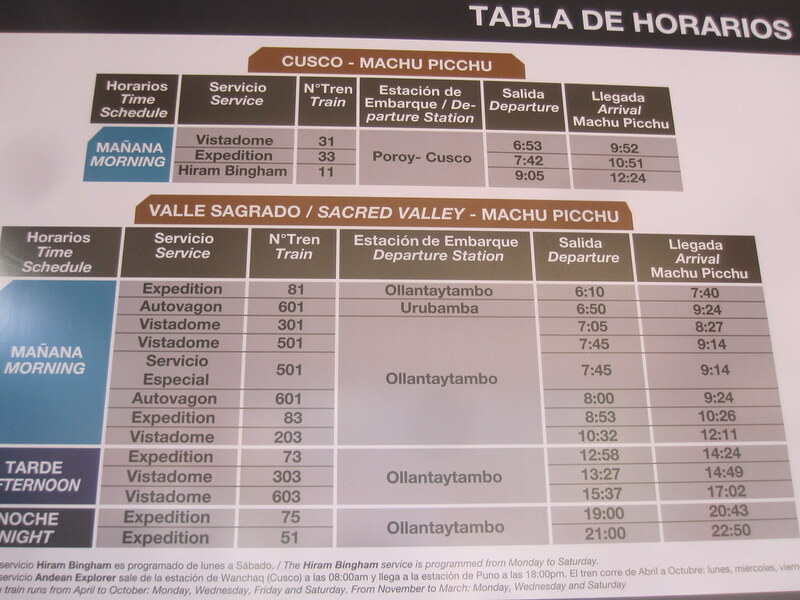 The is the table of trains from the Ollantaytambo Peru Train Station. It appeared to be reasonably accurate as of the day the photo was taken. There were 4 types of service. Expedition is the “backpacker” special and should not be taken by “elite” types who do not want to be on a very crowded train with a bunch of very rowdy backpackers. For people who want a little space as well as “peace and quiet” I suggest the Vistadome37 Service, which is about $19 more or $56 total meaning the backpacker service was $37. .Note that late services coming and going tend to be backpacker only. Note also that there are cheaper ways to get to Machu Picchu. The trains are actually quite nice. Its all the rowdy drunks coming back that make the 1.5 hour train trip to Ollantaytambo a pain. That is, unless you get drunk and join them. This entry was posted in Travel and tagged Machu Picchu, Peru, Train on October 3, 2011 by Steve.